by Bill Dwight on Tuesday, December 07, 2010 at 10:37 AM | LEAVE A COMMENT! We’re constantly scouring the Internet looking for articles related to family finances and teaching kids good personal finance habits. You can visit the FamZoo delicious page to see our ever growing list of family finance bookmarks. We’re up to 770 now! Each week, we pick our favorite articles from the previous week and post them here. 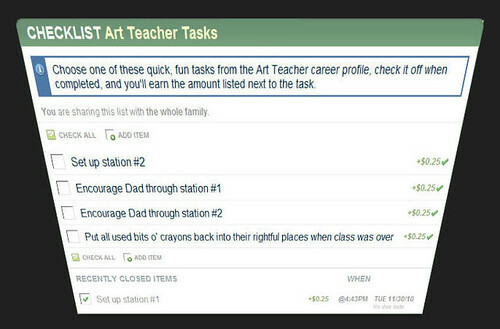 Here’s a very clever allowance strategy for young kids that I’d never heard of: pay your youngsters modest sums for sets of chores modeled after actual tasks culled from real professions — Art Teacher, Zoologist, Toy Designer, etc. This article previews an upcoming book that lays out the details for doing just that. It’s called Earn It, Learn It by Alicia T. Weinstein. You can find out more about the book on EarnMyKeep.com. Alicia’s site includes a thorough sneak peek — table of contents, intro, and two career profiles. Check out the PDF here. Quite some time ago, the grandparents set up custodial accounts for our kids to teach them investing concepts — very thoughtful, generous, and educational! If you or your relatives are considering a similar move, Bill’s quick five point article provides an excellent overview of the legal and tax implications. I learned a few things. Read it here. Tie Allowance to Chores or Not? OK, so this topic’s been done to death. But, what sparked my keen interest here was the raging debate in the comments on whether it’s morally acceptable to offer a six year old the optional extra paid chore of scooping dog poops at less than minimum wage — a real “cra@p” job so to speak! (I was tempted to base my blog graphic on this entry, but wiser thinking prevailed.) See the back and forth commentary here. By the way, I like MBHunter’s hybrid system of a modest allowance coupled with extra paid chores — whether cr@ppy or not.